Simon Riggs, Gianni Ciolli & Gabriele Bartolini. 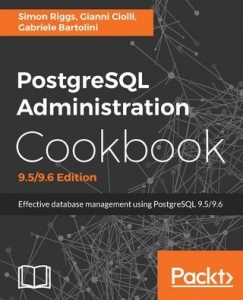 The Third Edition of the best selling PostgreSQL 9 Administration Cookbook is now available. A practical guide, this cookbook will ensure you run a smooth PostgreSQL database. Through example-driven recipes, with plenty of code, focused on the most vital features of the latest PostgreSQL version (9.6), both administrators and developers will follow short, specific guides to understand and leverage useful Postgres functionalities to create better and more efficient databases.